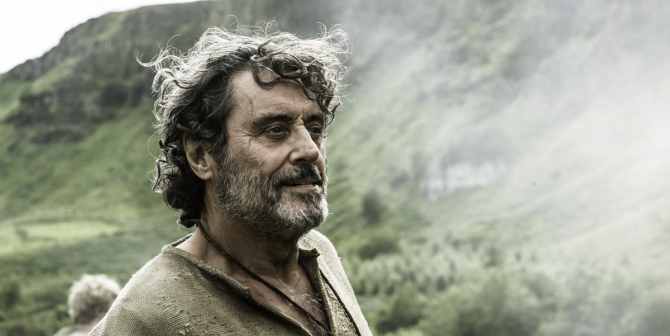 Ian McShane will bear witness to the Rise of the Blood Queen. The Hollywood Reporter brings word today that McShane, known for his scenery-chewing performances across Game of Thrones, American Gods and the John Wick films, has landed a prominent role in the upcoming Hellboy reboot, which is in development over at Lionsgate and Millennium. Headed up by director Neil Marshall (The Descent, Game of Thrones), with David Harbour (Stranger Things) on board to play the titular, cigar-chomping demon, THR is reporting that Ian McShane has sealed a deal to play Professor Trevor Bruttenholm (or simply Professor Broom), Hellboy’s adoptive father. It’s another high-profile role to add to the actor’s growing collection, and McShane is arguably one of the few actors working today capable of bringing the necessary amount of gravitas to Marshall’s revival. Story-wise, today’s report also included a fleeting piece of intel, revealing that Hellboy: Rise of the Blood Queen will see Harbour’s reluctant hero “squaring off against a medieval sorceress who seeks to destroy humankind.” Lionsgate appears to be playing it relatively safe in the narrative department, then, but there have been rumblings that Rise of the Blood Queen could herald the beginning of a franchise, so the studio will be hoping that its Hellboy reboot hits big in 2018. Filming on Hellboy: Rise of the Blood Queen is due to commence in September – the UK and Bulgaria have been listed as two primary locations – ahead of a theatrical release in 2018.